In our second weekly indie RPG developers series, we’re chatting with Liam of Sandy Pug Games on his process and history with games! Stay tuned for links as to where you can support Sandy Pug Games at the end of this interview! What was the game/game system that inspired you the most to start creating? Some of SPG’s latest, more developed artistic skill. Originally, I’d have to say it was D&D 3.5. These days I really don’t like the kind of design ideology behind the system, but it was my very first peek into the world of RPGs, and it’s what got me started making and creating little adventures, characters, monsters. 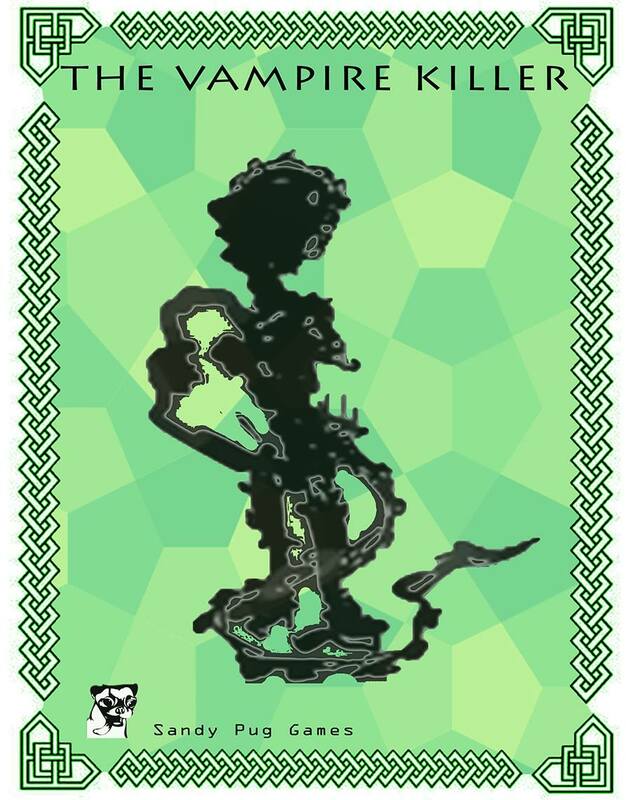 One of the cool things about the system was that it was possible to create a sort of monster template, so you could have a Giant, and apply the Vampire template and have a Giant Vampire. That was one of those little things that just got my imagination churning. What inspired me to start actually making and selling RPG supplements has to be Dungeon World. I know the Axon Punk folx said the same thing and I have to echo them. It’s a tool set that allows you to create with this intense focus on narrative that means I can just say a Cool Thing Happens without having to justify it with maths and tables. DW also allows characters to be really, really unique, and so developing one is sort of like developing a tiny little game in and of itself. Of course, Sandy Pug Games was originally a board game design company. It’s hard to say what inspired me there, just a general love of the hobby and a desire to share my ideas with people, nothing specific. Aside from the standard issues of money and large audiences, what’s the biggest difficulty you’ve faced as indie designers? Some of Sandy Pug’s earlier art, as mentioned. Well, that’s a really interesting question. In the actual process, it’s art. I’m an awful artist, I have no ability to create images myself, and when I started, I was a god awful Photoshopper, too. One of those things had to change, clearly! Fortunately there exists a couple of incredible communities like the OpenGameArt.Org and Pixabay.com that are full of people donating their work for public use or creative commons licenses that allow people to make profit off of it. For instance, Boughs was originally supposed to have this sort of water-color artwork throughout, but eventually I had to scale back to this kind of scratchy, lo-fi stark black design. It works really well and I’m happy with it, but you get the idea. I’m also blessed with lots of great artistic friends and partners that help me a great deal. Outside of the creation process: maintaining motivation has to be one of the hardest things. For us really, really small people, the one-person studios designing small scale stuff, sometimes you have months where nothing sells. Sometimes you make a big deal out of a release and no one catches it. You send emails to publishers, news sites and reviewers, but they’re all swamped with 1000s of emails every day, and so standing out is exceptionally hard, and it’s just difficult to not let that get to you sometimes. You have to push past it, go make something new, find some new contacts or whatever, but it’s a struggle. Thus far, what’s the most extraordinary opportunity designing has afforded you? I wish I had something big for this, but seriously, its just an honor to hear that some people play my characters, run my adventures or play in my settings. I have gotten to meet some incredible people, some of my favourite designers, and I go to GenCon every year now. Overall though, the best thing designing does for me is seeing that latest 1.99 purchase, and knowing somewhere, someone decided my work was worth a little of their labor to buy. Liam GMing as a Warboy at Gen Con. How have you worked towards more inclusive gaming? SPG always aims to make everyone feel welcome in the worlds we make. Our games and settings are full of people who don’t fit the mainstream labels, both in the real world and fantasy. 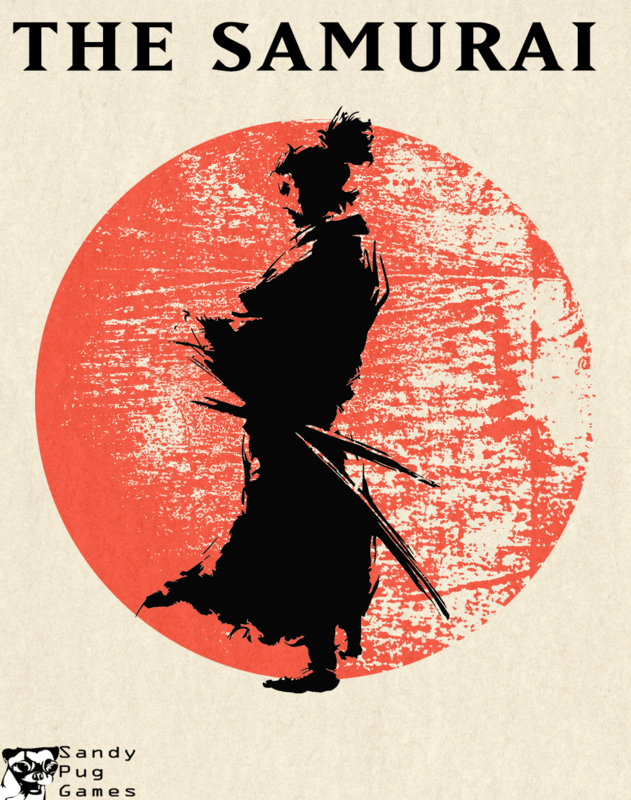 My design approach when it comes to social issues is always to build worlds and characters that represent the world I would like to live in, that is to say, a diverse crowd of incredible people along all sorts of intersecting lines. I wouldn’t say this is working toward anything, it’s just the default we start from. Boughs, our upcoming setting, tackles issues of immigration and class pretty head on, while also being set in a world where Gender and Sexuality are fairly wobbly concepts, given that most of the races of the world lack Human sexual dimorphic standards. Xenophobia is deeply embedded in most of the societies players will meet and their group was once the outcast of the world that it now begrudgingly acknowledges it needs. This means that PoC or genderqueer players can comfortably make characters that represent themselves, or expect to run into characters like them free of oppressive elements, while still raising difficult subjects in a way that I hope makes for interesting play without stepping on anyone’s toes. I don’t want to directly transpose real world issues into our settings. That risks upsetting people and taking away the escape I know a lot of people play these games for, but by including some analogous or comparable forms of fantastical oppression, it allows players that want to attack these ideas the space to do so. Other than how we build our worlds, SPG is also dedicated to making our documents and files as accessible as possible. I have an ongoing project to make everything we design and develop screen-reader formatted and I’m working on recording everything as sound files too. A few months ago, I ran a poll gathering information on the needs of the disability community with regards to gaming, and found some really interesting stuff that’s colored my future work a lot. It’s an ongoing project for us but it is very, very important. I’d also love to have our work translated soon, when we can afford to pay someone for it, heh. What’s up next/currently in the works for Sandy Pug Games? Right now we’re finishing up a setting called Boughs, a sort of fantasy mashup between Dredd and the Boy Scouts. The world of Boughs is this incredibly vast and deadly forest that’s effectively infinite, dotted with immense trees that house entire civilizations and societies, each hugely diverse and most importantly, strange. 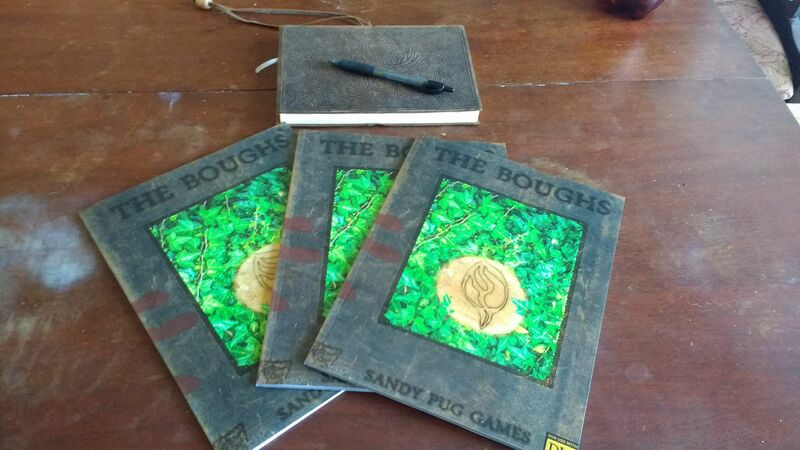 Sandy Pug Games’ new release, The Boughs. Players take on the roles of Rangers: part police force, part diplomats, part mercenaries. Rangers are the only people capable of surviving long term outside of the Trees and have made it their mission to use these skills to try and bring peace and harmony to the world while also attempting to learn more about the world and understand it. Throw in a lot of really weird and unique races, factions and monsters, and I think Boughs is one of the most interesting things I’ve done so far, it’s really taken a lot of work, but I’m proud of it. It’s also our first print game, so that’s pretty cool! After Boughs is done, I’ll probably spend some time working on an adventure I wrote called the Infernal Bone Machine, which is a Dungeon World adventure set inside a cool Lich’s personal bone-powered logic engine dimension. It’s a lot of fun. I’m going to be working on some more Dungeon World character sheets, maybe another Fiasco playset or two. One of the great things about being in that smaller-than-indie bracket is that I can really do whatever I want, which is both terrifying and freeing at the same time. Support and Follow Sandy Pug Games!